I can’t think of a better way to end this series on defining Catholic fiction than an interview with Dominic de Souza, an author who has written a book on exactly this subject! Dominic de Souza is a Catholic, American dad and novelist passionate about world-building, visual design, and epic fun. He writes, blogs and offers editing services at www.catholicauthor.us . He is also the author of several children’s books, including Sense of the Sacred: Illuminated Book of Catholic Prayers. And now for Dominic. Do you have a favorite Catholic fiction author? I bit into Chesterton in my first year in college, and formed a fast friendship with his rambling, intense style. He has written a number of stories that break open the heart of a true Catholic soul rapt with the transcendent and the darkly human, and how grace works with both. While his language is certainly more Victorian, it’s a mental hauling up back to his level to enjoy the richness of his vision. What qualifies an author’s fiction as Catholic fiction? How do you identify a novel as Catholic Fiction? In a sense, any author, atheist or Christian, can write ‘Catholic fiction’. Let me explain. If we understand that Catholicism is religion instituted by Christ, and as God, it therefore encompasses every atom and attribute of this universe, whether of the world of angels, demons or men. Any story that is ultimately grounded in a universe as understood by God and expressed through the ordinary medium of His Church, counts as Catholic fiction, in a loose sense. Obviously, this opens the door wide to a multitude of books and stories, and in the spirit of St Basil’s address to Youth on Greek literature, anything that praises the good and condemns the evil should be preserved, for this is a fundamental sigh of our souls, stemming from Heaven. The Church has always celebrated the good, true and beautiful wherever it is found, regardless of culture, time or place. So a book written by a modernist that inspires a deep appreciation for family, or honor, or some good value, can be more efficacious in the growth of goodness in the world compared to a poorly invented miracle story filled with Catholic religious. Within the Catholic world, there is obviously a tighter definition of ‘Catholic fiction’, as something that can be overtly and – perhaps immediately – understood to be in support of our Creed and the culture in which the story is written. The Catholic convictions of the author guarantee for us that the story we are embarking on, or sharing with our children, is one that is safe, and won’t challenge our deeply held beliefs. Flannery O’Connor is quite emphatic that good ‘Catholic fiction’ may well not be readable, or enjoyable by most Catholics. The idea that fiction written for Catholics should be less challenging is not necessarily accurate. While a Catholic author should always have a clear audience in mind, not everything written by a Catholic author should be readable by every Catholic. A reader has as much responsibility to be prepared to read what an author may provide him. Do you think a book that doesn’t mention religion or Catholicism can be Catholic fiction? Catholic Fiction is not dramatized evangelization. Leave the apologetics to the apologists. Fiction is an area of creative art where authors sub-create worlds, events and people to communicate an idea. Catholic authors have a greater responsibility to communicate the beauty of goodness and the detestability of evil, however they may choose to. While a non-Catholic audience may be interested in stories of saints and nuns, priests and popes, they see them as strange artifacts of a dying super-religion. Perhaps that’s not the best starting point for a discussion. As always, a Catholic author must have a pretty clear idea of the audience he/she is writing for, and tailor their story accordingly. What do you think separates secular fiction from Catholic fiction? More often than not, secular fiction is similar to a sailor waking up alone in the middle of a shipwreck, sitting on an uncharted beach and surrounded by a wealth of washed up, disconnected artifacts, unintelligible scrolls, and remnants of ancient cultures. As he tries to create some sort of life and meaning, he pulls together random elements as they speak to him. Over time, trying to guess at the ‘real’ meaning behind these things, he tells himself stories based on his experiences and assumptions. If the captain of the ship was around, he could tell him that this was one of many convoys from a great, Catholic empire. He could explain how all the pieces worked together, and read to him from the wealth of literature feeding his fires. Secular fiction is often in love with certain virtues, and rejects certain vices, but everything is unmoored from a single theology that makes sense of the world. Obviously, misunderstanding is rife, wrong assumptions become popular memes, and often misinformation goes viral because it fits the story that an anti-Christian culture is being told. Secular fiction doesn’t know where to draw the line between good and evil, because it can’t decide on those definitions. Because of that, heroes, anti-heroes and villains are a confused mix of tropes, themes and theologies. All that being said, there are many excellent, excellent secular storytellers out there. We have only to look at the most popular stories in books and on television to see that they well know how to captivate an audience. Good, Catholic fiction is grounded in an authentic understanding of the world, stemming from a deep familiar with the lure of sin, laments of lost graces and grappling for redemption. On the surface, Catholic fiction may not seem any more religious than secular fiction. It does quietly, or aggressively, advocate universal truths, delve into the core of the commandments written in all our hearts, and ultimately start a discussion, plant a seed, change a paradigm. Do you identify your own novels as Catholic? What makes them so? All of my novels are ‘Catholic’, in the sense that they are all born in a world built on Catholic theology, or dreamed up in a fantasy world inspired by our Faith. The spiritual war between goodness and evil is the foundation of all books, and a desire to learn more about the truth, to love goodness and promote beauty is the backbone of everything I write. Are your books explicitly Catholic, or are they secular stories with Catholic themes? Most of the material that I’ve been sharing is of the overtly Catholic kind, meant for an expressly Catholic audience. Some of the larger novels that I am working on will try to step away from such explicit Catholicism, to try to reach other audiences with the building blocks that make up our worldview. I well may write ‘secular’ seeming stories in the future, and embrace the opportunity, but I believe that a Catholic author can write anything, and shouldn’t feel restricted to writing happy endings, fairy tales and Frank Capra-esque ‘It’s a Wonderful Life’ riffs. So much of the light and beauty of Catholicism has been exorcised from popular culture. Modern culture is ripe for dark stories, and a Catholic author is the only kind I trust to tell those stories well without getting lost in the darkness. You can find How to be a Catholic Author free on Dominic’s blog. Look to the sidebar. And check out his children’s fiction while you’re there, including the companion coloring book for Sense of the Sacred! Thank you for joining us for this series. We would love to hear your thoughts on what makes Catholic fiction. Today we hear from author Amanda Lauer. Lauer is the co-author of Celebrate Appleton, A 150th Birthday Photo Album, and contributed to the books Expressions of ITP…Inside Stories, and Living Virtuously — Keeping Your Heart and Home. In addition to her writing career, Lauer has a passion for spreading the message of true health — physical, mental and financial. Her first novel is A World Such as Heaven Intended. which is also the name of her blog. That’s going to be a tough one because I have a lot of Catholic friends who are authors! But I will go with Ellen Gable (Hrkach), who is not only a very talented writer and copy editor, but is also my publisher. She and her husband James Hrkach own Full Quiver Publishing. To me, any fiction novel written by a Catholic author could be considered Catholic fiction or a novel written by a non-Catholic could be Catholic fiction if there is some thread of Catholicism in the book, they’ve done their research on the Church and the faith, and Catholicism is painted in a positive light. Catholic fiction novels can be identified if they are published by a Catholic publishing house, if they have received the Seal of Approval from the Catholic Writers Guild or another Catholic entity, or if they’ve won recognition such as the CALA award (Catholic Arts and Letters Award). Absolutely! Catholicism can be woven into a book without the word Catholic being used at all. Look at The Hobbit and The Lord of the Rings series. For me, there are guidelines I follow writing Catholic fiction and lines in the sand that I will not cross. My books are historic romance novels but are not “bodice rippers.” While the trilogy I’m finishing is set during The Civil War, I don’t go into graphic detail about the horrors of war. My goal is to write novels that reflect my Catholic faith, are in line with Saint John Paul II’s Theology of the Body teachings, can entertain and inform my readers, and that I would feel comfortable having my children and grandchildren read. My novels are Catholic because that’s my perspective on life so it comes out in everything I write. The main characters in my books are Catholic but aren’t holier-than-thou. Like every Catholic, in any era, they struggle to stay true to their faith and to become the best version of themselves. My books aren’t explicitly Catholic — they are heart-warming stories of people who happen to be Catholic who are caught up in events going on around them in the course of history. While countless books have been written about these particular eras, like the Civil War, not many have been written from the Catholic perspective. Hopefully people learn more about the roots of the Catholic faith from reading my works. Perhaps this will inspire non-Catholics to study the Catholic faith to really learn what it’s all about after — it may change their perspective of Catholics and the Church. What are some Catholic themes? One particular Catholic theme that is near and dear to my heart is respect for life. But in general the books show how Catholicism is woven into everyday life for my characters — they go to church, go to confession, receive Communion, pray, have a devotion to the Blessed Mother. They acknowledge they are sinners but are looking to better themselves with the hope of getting themselves and the people they care about to heaven someday. Tomorrow we hear from author Dominic de Souza. Today, we turn to author Jane Lebak for an answer to that question: What is Catholic Fiction? Jane L ebak writes books and knits socks. She lives in the Swamp with her Patient Husband, four kids, three cats, and several fish tanks. 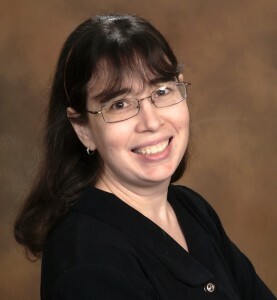 She also blogs for QueryTracker.net, a resource for writers seeking agents and small publishers. My favorite currently-writing Catholic fiction author would have to be Karina Fabian. She creates in-depth characters whose faith is seamlessly woven into their lives while at the same time positioning these characters in fully-realized worlds. I think Catholic fiction has elements of hope that are frequently lacking in secular fiction, plus an element of recognizing goodness in creation which sometimes is missing from mainline Christian fiction. Because the sacraments all have a material component, Catholics seem more embracing of all the physical aspects of our faith lives. In fact, I think an awareness of the sacramental element of God’s plan is very definitive of Catholic fiction. Catholics tend to be very “sensual” in terms of relating to God because you can’t get much more physical than bread-become-God, putting it into your mouth and tasting it. God-made-flesh, or water that removes original sin, or any of the physical aspects of the sacraments fuel the Catholic understanding of God as inherently a part of creation. To some extent, all Catholic writers are going to imbue their fiction with an understanding that God is with us not just in spirit but in the world we inhabit. It can, and sneaking it in the back door definitely has its place. “Stealth evangelism” is mostly seed-planting. All the same, when I write secular fiction, I don’t try to market it as Christian even though there’s usually some moment when the characters are examining their belief system or intersect with someone who is Christian. An awareness of the moral components of our daily decisions. Catholics believe that our everyday decisions do matter: whether because they shape us for eternity or because they affect other souls. This isn’t absent from secular fiction, but in secular fiction, you’re more likely to find fiction that’s hopeless about the human condition or where the characters are fully self-centered. And in secular fiction, there isn’t always the sense that there’s something greater to be achieved than just personal fulfillment or personal growth. Some of them, some of the time. Other times people are surprised, and I get reviews along the lines of “I’m an atheist, but I liked God the way she wrote Him.” Those are the best moments because I feel kind of like God used my story to show Himself to someone who doesn’t know Him yet. And if God used my story to plant seeds regarding the Church, then that’s wonderful. The angel novels and the Father Jay novels are definitely Catholic, but that’s because the characters are angels and priests. Pickup Notes is not Catholic even though a Catholic wrote it, but I was specifically intending to keep that one for the secular market (and yet you have a Catholic character whose faith infuses her opinionated self, and a sense of connectedness to the world, and so on.) In the middle you have Honest And For True,, which while they have an angel and do raise spiritual questions, are primarily about fun and one person’s growth. That series straddles the line, and I’d hope anyone could enjoy it. Finding goodness in the world around us. Hope. Making a great impact with our small daily decisions. Staying true to our duties as a means of being malleable to God’s design. Mercy. Tomorrow, we will hear from Amanda Lauer. Today we continue to answer the question: What is Catholic fiction? Tim Speer’s highly rated first book, Return To Paradise, was published in April 2015. Unfortunately, prior to writing my first book, I was unaware of the diverse amount Catholic fiction that was out there. As a result, my reading had been sadly lacking in this genre. I now have read several works of Catholic fiction and am continuing to read more. And although I have enjoyed all of them so far, I have not progressed to the point of having a favorite author. Catholic fiction should in one form or another present and promote Catholic beliefs and values. If a novel presents Catholic beliefs, either through the direct actions of the characters, or through the events that take place, then it could be identified as Catholic fiction. Possibly, but I think it would be hard to do. It would have to convey Catholic belief systems in some manner. It’s possible this could be done through the actions of the characters or the events that take place, but again, I think it would be difficult to do without mentioning religion or Catholicism in some way. Secular fiction does not have any need to contain Catholic or religious elements. It could contain a certain amount of religious material; however, as soon as it promotes religious ideas it becomes religious fiction. And if it promotes Catholic ideas and beliefs, then it becomes Catholic fiction. Yes. Both of my books contain characters that are Catholic. But beyond that, they introduce and present several Catholic beliefs such as: the real presence in the Eucharist, Adoration, the intercession of Mary, Confession, the Crucifix vs. the empty cross and other aspects of the Catholic faith. My first book, Return To Paradise, could have been written as a purely secular story. However, as written, it contains numerous Catholic themes. My second book, Seventy Times Seven, is definitely a Christian-based and themed story. It would not necessarily have to have been Catholic-based, as it is, but I think it would take away from it significantly if the Catholic content had not been included. General Christian themes include following God’s will, prayer and answer to prayer, forgiveness and redemption. As mentioned above, specific Catholic themes include the Eucharist, Adoration, the intercession of Mary, Confession, and the crucified Christ. Tomorrow, we’ll hear from author Jane Lebak. The question is asked at every Catholic writers’conference. What is Catholic fiction? What qualities does a book need to qualify for that genre? I’ve asked several Catholic authors to help define the term. In this series, each author will respond to survey questions. My hope is that aspiring Catholic fiction authors will receive confidence and clarity from the answers! We begin our series with author Carlos Carrasco. Carlos was born in Havana Cuba in 1963. Since 1968 he has lived in the US, aimlessly bouncing from state to state and job to job. In 2013 he gave up his heathen ways and humbly entered the Catholic Church. At last he has come to rest on a five acre patch of South Carolina where he farms by day and writes by night. It is set in an open-ended universe, even if its setting is limited; its outlook is hopeful even if the story ends in tragedy. The author’s treatment of faith. A secularist would either dismiss or deride faith in his tale. Yes, my works are explicitly Catholic. They contain Catholic characters pursuing and exploring Catholic themes and doctrines. The House of War: Book One of The Omega Crusade, is a political thriller set in the near future. It is the story of a coup which topples the US Government and sets Christendom, Islam and Secularism on a cataclysmic collision course! Tomorrow, we’ll hear from author Tim Speers. Here are just a few of the new releases from Indie Catholic Authors! Who are we? We are Catholics who have self-published or are considering self-publishing. Our fiction and non-fiction books are written with a Catholic worldview. And now, for a sampling of our member’s new releases! See Jeannie’s recent appearance on EWTN’s At Home with Jim and Joy. ROSA SOLA is a novel for ages 9 and up, 2015 recipient of the Catholic Writer’s Guild Seal of Approval, and was named a BOOKLIST “Top Ten First Novel for Youth”. Links to buy this and other books by Carmela A. Martino are here. Carmela is a published author and a writing teacher. She writes short stories, poetry, picture books, nonfiction, and novels for children and teens. Her first children’s novel, Rosa, Sola, is published by Candlewick Press. She teaches at College of DuPage and Mayslake Peabody Estate (and will soon offer writing classes through Waubonsee Community College) and blogs at Teaching Authors. It’s twenty years after the Resurrection, and rumors coming out of Hell are that Satan’s got a new weapon in development, only no one knows what it is. When the archangels Remiel and Zadkiel infiltrate Hell to learn the truth, they discover that new weapon only to unwittingly set it off. The weapon maims Belior, one of Satan’s highest-ranking demons, but also leaves Zadkiel blind and Remiel disabled. The angels have a limited time to reverse the effects of the weapon, assuming it can be done at all, but that means sneaking back into Hell and confronting old enemies…old enemies who were once even older friends. Remiel and Zadkiel seek refuge on Earth among the early Christian community and must at the same time avoid or disarm Belior, one of their deadliest enemies. Because like any predator, a wounded demon is twice as dangerous. And Belior knows they hold his only chance to save himself. In the newest novel of the Seven Archangels saga, Jane Lebak packs action and heart into every page as the angels struggle to save their comrades, even at great personal cost. This is book three in the Seven Archangel series and is available here. Playing viola in her string quartet is the only joy in Joey’s life. It’s the reason she can tolerate her toxic family and her day job as a tollbooth operator. But the only reason Joey isn’t a “starving musician” is that peanut butter is cheap, and you can buy day-old bread for a dollar. Her quartet needs to start making money, and soon. When a bride gets so drunk she forgets she hired a classical string quartet, Shreya stuns everyone by ripping off a guitar riff on her violin. Suddenly Harrison sees dollar signs in the air: they can fuse rock music with classical quartets, even if it means changing their entire repertoire. In her newest novel, Jane Lebak explores the forces that keep a sensitive person silent and how the voices around you can help unleash the song of your heart. Jane Lebak talks to angels, cats, and her kids. Only the angels listen to her, but the kids talk back. She lives in the Swamp, writing books and knitting socks, with the occasional foray into violin-playing. You’ll also find her blogging at QueryTracker.net,a resource for writers seeking agents and small publishers. Pickup Notes is available here. After first playing a hero and rescuing Amy from imminent danger in the wilderness, Michael agrees to help her again. This time providing legal help to try to save the Life Center that Amy manages. However, it may be Michael who is the one most in need of help. And however daunting his rescue of Amy may have been, Amy now faces an even more challenging task. She soon finds that Michael is haunted by a troubled past. And that he has undertaken a mission that she knows can only lead to darkness. While Michael saved her life, Amy must now try to help save Michael’s soul. To do so she will have to get him to face his past, to find and accept the forgiveness that not even he is willing to give himself, and more importantly, to forgive those who are the objects of the hatred he holds deep within him. The timing for An Eye for Others: Dorothy Day, Journalist 1916-1917 couldn’t be better. On April 19, 2016, the Archdiocese of New York announced a canonical inquiry into Dorothy Day’s life. Currently a Servant of God, she is on the next step in the formal process of Sainthood. There are many ordinary people whose names we will never know who lived as saints, but Saint with a capital “S” would lift Dorothy to the role of an acknowledged example of how to live as a disciple of Christ. This inquiry will include a theological examination of her writings with an eye for doctrine and morals, and An Eye for Others is a good place for the curious layperson to start. 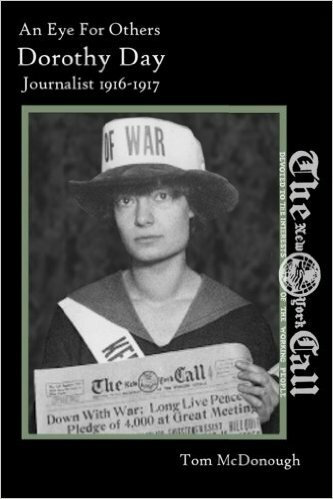 The book, written by Tom McDonough, covers Dorothy’s articles for The New York Call and The Masses from 1916-1917. McDonough puts the articles in context by reporting on what Dorothy and New York were going through during the year leading up to World War I, sometimes in Dorothy’s own words from her later writings. This gives the reader a unique and personal perspective of an important moment in history. A dedicated advocate of the poor, Dorothy lived a bohemian life with a string of lovers, an attempted suicide, and an abortion before she converted to Catholicism. Through her writings, the reader can understand the basis for her attraction to Socialism and similar ideologies as well as the disillusionment that caused her to later abandon them. I left the office chastened. Yes, such reckless extravagance must cease. 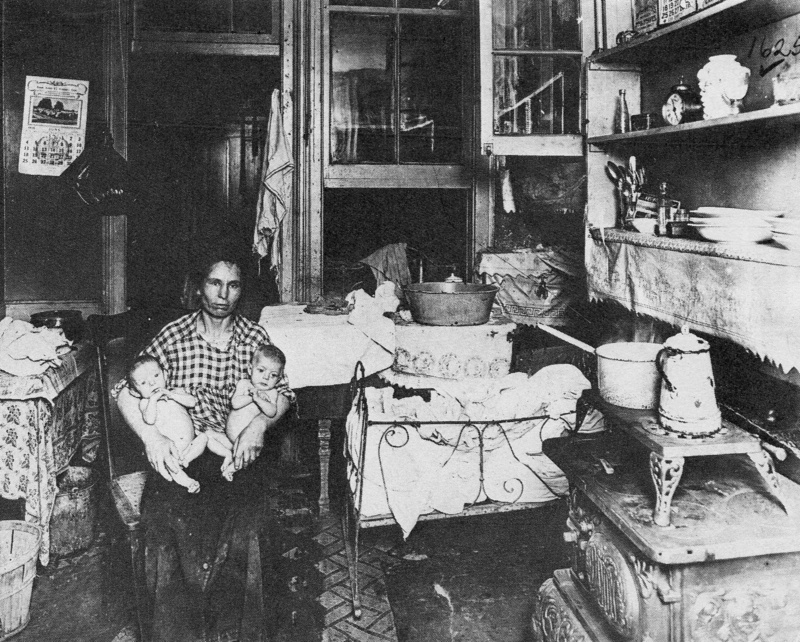 The articles also bring to light some shocking reflections of the time, such as the amount of money the wealthy Astor family spent on their baby, while children all around New York were starving: $75 per day for baby Astor (almost $1,800 by today’s standards) as compared to $0.33 per day for the poor. The poor were struggling to find work and to eat, while controlling corporations focused on price-gouging for profits, especially as the U.S. geared up for war. Dorothy passionately called out the hypocrisy embedded in the responses of politicians and the wealthy. It was disheartening to find that some things never change. Workers were being left without jobs, having been replaced by machines. Today, those jobs go to computers or overseas. The left was committed to abortion as a solution to the poor, as if eradicating them would make their lives better. Mainstream media channels weren’t trusted, though, ironically, it was the left that feared they were controlled by the right. The media’s agenda for the most part has flipped from right to left these days, but the root fear that corporations controlled the message remains the same. In the end, Dorothy realized that the various ideologies that first attracted her were in love with their way of thinking – without any real love for the person. Fortunately for us, she chose the latter and went on to join forces with Peter Maurin to establish the Catholic Worker Movement, a charity dedicated to the Works of Mercy and the God-given dignity of every human person. Reading An Eye for Others won’t give you a full picture of Dorothy Day’s life, but it’s a great start to understanding the woman Pope Francis recently praised as an example of “a great American.” By the end of the Church’s investigation, I think we’ll find she was much more than that. Jackie began her writing career in Illinois at a single-digit age when her favorite dog died in an accident. Though her focus is mystery novels, she also writes children’s books, short stories, the occasional non-fiction piece, and screenplays. She’s even turned a short story into a play, “Streetcar Named Death”, which she secretly hopes to see produced by community theaters around the world. She blogs at jacquelinevick.com.